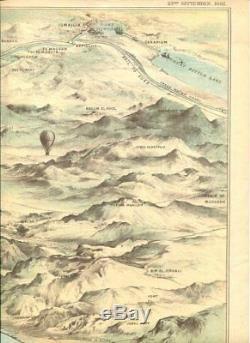 The map is a large double-page illustration from an 1882 issue of the weekly illustrated newspaper The Graphic. The map is a chromolithogaph (see definition below). The sheet measures 23 1/4 X 15 3/4 inches and is in good / fair condition due to light vertical bends, light age toning, minor soiling, minor foxing spots, a repaired tear in the tip of the upper left corner, a small repaired tear on the upper edge, and a central publisher's fold (as issued) with a small split on the bottom edge. 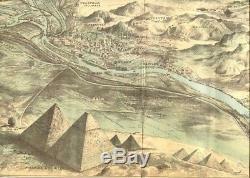 The image is titled : Birds Eye View of Cairo Looking North East. It is inscribed across the top : Special Gratis Supplement. There is nothing printed on the reverse side. This is an original antique map guaranteed to be over 135 years old. It is not a modern re-print. The print will be mailed in a mailing tube. A chromolithograph is a lithographic process patented by Godefroy Engelmann in 1837. For every color present in the image, a sepearte printing stone or plate had to be inked. The colors were built up in transparent layers. (Unlike photomechanical processes which use precise dots of only three colors red-blue-yellow and black and to get the other colors the dots are put close together). The way to distinguish a chromolithograph from a later color printing technique is to look at it with a magnifying glass. If it breaks up into color "blops" it is a chromo, if it breaks up into perfect rows of dots under magnification it is a photomechanical process. Chromolithography was used mainly between 1855 to 1905. 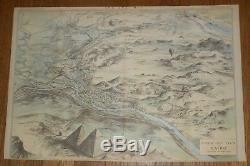 The item "1882 Antique Map Bird's-Eye View of Cairo Egypt with Pyramids & Hot Air Balloon" is in sale since Wednesday, July 18, 2018. This item is in the category "Antiques\Maps, Atlases & Globes\Africa Maps". 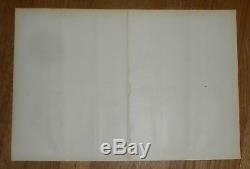 The seller is "printyman" and is located in Brunswick, Maryland. This item can be shipped worldwide.